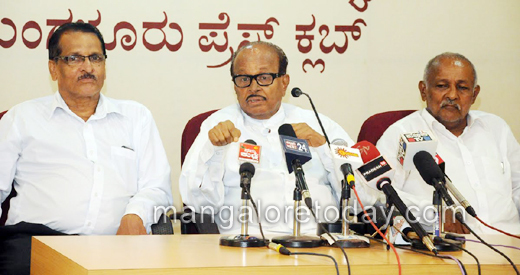 Mangaluru, July 27, 2016: Addressing media, Senior Congress leader B Janardhana Poojary on July 26, Tuesday warned Chief Minister Siddaramaiah that he is in a tight corner. Poojary said, "Chief minister, your position is shaky. You still have time. At least, listen to the high command and rush to New Delhi." "Else, the legislature party meeting will be called and Oscar Fernandes will be made the chief minister or M Mallikarjun Kharge will be succeed you. If need be, MLC Motamma may be selected among women. Even home minister and Karnataka Pradesh Congress Committee (KPCC) President G Parameshwara is also in the race." Poojary, in his usual best, denied to reveal the sources when the media sought to know whether he was making any baseless predictions. However, he went on to remind mediapersons about some of his predictions coming true in the past. "I will extend my full support if Siddaramaiah puts the house in order. Given the current circumstances, the mistakes committed by the ruling party are becoming an axe to BJP who are making all efforts to chop down the CM Sidddu." Woman SI’s suicide bid : Poojary criticised Chief Minister Siddaramaiah for handling the issues surrounding police officers in the state. Referring to the recent incident where Roopa, a woman police sub-inspector attached to Vijayanagar police station in Bengaluru, attempted suicide alleging harassment by her superior officer-inspector, Poojary questioned as to why a first information report (FIR) was not filed against that officer, as abetment to suicide (bid) is also a cognisable and non- compoundable offence. Poojary charged that the chief minister is set to change the definition of dying declaration as it was evident in the case of Dy SP M K Ganapathi who committed suicide recently and IAS officer D K Ravi previously.